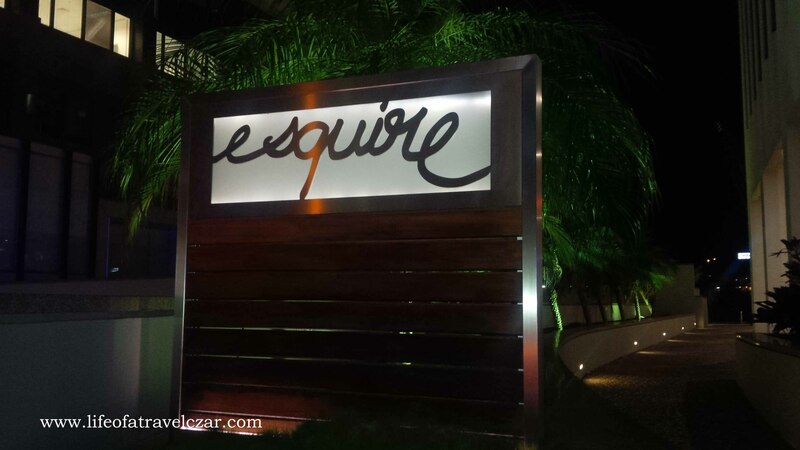 Esq is the casual bar dining section in the quality dining establishment of Esquire. It overlooks the beautiful Brisbane River and is situated in the lovely Eagle Street dining district. Esq focuses on quality produce and the restaurants signature charcoal fire pit to deliver a dining experience which is anything but casual. I arrive nice and early and the waitress places me on the bar, where I can gaze longingly at the beautiful kitchen, the charcoal pit and fire wood. It’s quite a view. I opt for the glass of Si Vinters Red Blend (Malbec, Cabernet Sauvignon, Petit Verdot) from Margaret River. I then chill in my seat and watch with anticipation as the night unfolds. The aesthetics of this dish is amazing as the shiny green mustard is such a contrast of colours next to the white and red trevally sashimi. The beautiful soft jelly like texture of the trevally is amazing and showcases the full flavours of the fish. The green mustard is a wonderful companion, with a beautiful distinct touch of additional spice and tang which serves its purpose but is soft enough not to overpower the dish. The pickled ginger proves to be a beautiful palate cleanser in between bites, while I sip on my Lillet Blanc and Soda Water like a lost child at the royal show. (Lillet Blanc is an aperitif wines made from a blend of Bordeaux wines, citrus liqueurs and green apple). The fruit flavours and light bitter bite from the Lillet Blanc proves to be quite the little sensation and tingly experience I need tonight. The wagyu rump cap is soft and succulent, with the firm seared outer section being a beautiful contrast of textures to the rarer middle of the rump cap. The juices of the wagyu are indescribable, the full flavours shine through the dish proving that the simple presentation and techniques are sometimes the best. The horseradish provides some flavour and a hot “bite” to the dish, but the juices from the wagyu still outshine it to define the dish. It is a captivating experience. I choose to pair the dish with the beautiful Margaret River Petit Verdot. It is a truly amazing tasting experience with all the senses completely powered to full speed. The blackberry and spice aromas waft from the glass to send your senses into overdrive. The distinct black fruit flavours are there with a hint of chocolate while the Malbec adds a rich body to the wine. There is also the discernible taste of cherries and glow of the currants which stem from the Cabernet to round out the drinking experience. It’s such a full and deep wine which is easy to drink, no pretensions, just fantastic on the palate. I love it so much, I refuse to stray from it for the rest of the night. The kale is soft, lush and is the perfect side with the leafy texture being quite the contrast to the wagyu rump cap. Its such a beautiful dish with the strong garlic flavours shining through and the crunchy textures of the garlic chips providing a beautiful contrast to the texture of the sautéed kale. The soft black beans in the dressing add a light oriental overlay to the side. The soft creamy corn flavour parfait, which just melts in your mouth, has the distinct taste of popcorn (from the sprinkling of popcorn dust) which permeates every taste bud. This is a dish of little contrasts, the richness of the creamy parfait with the soft taste of the sweet corn, the creamy texture of the parfait with the crunch of the popcorn dust…its a magical dish. I continue to sip on the beautiful glass of Si Vinters, so absorbed in the experience. The best dining experiences are when your eyes don’t wander, your mind is disengaged from everything but the food and the food doesn’t just touch your tongue but touches your soul.